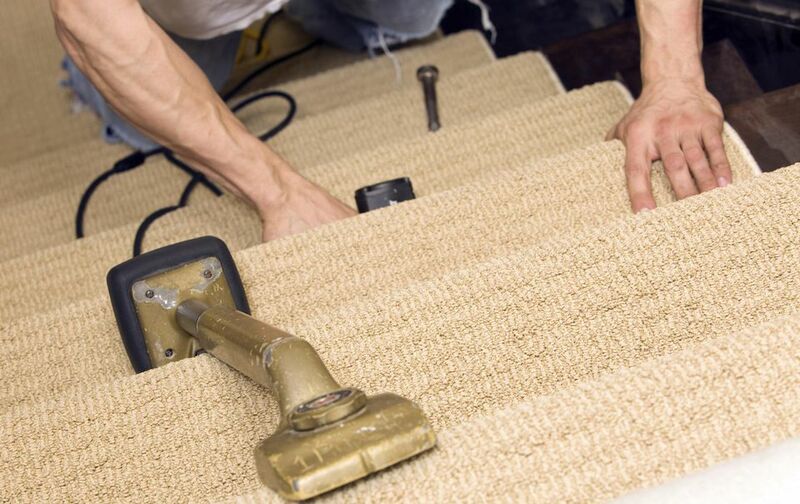 Once you have selected your carpet, measured your stairs to calculate how much carpet you need, and purchased your new carpet and underpad, you are ready to begin prepping your stairs for installation. This article includes instructions on how to prep stairs for installation of carpet covering the full stair. However, if you are looking to install a carpet runner on your stairs, the following instructions can be modified accordingly. There are a couple of specialty tools you will need to install carpet on stairs, in addition to the basic utility knife and measuring tape. You will need a powered stapler (either electric or air) – these can usually be rented at a rent-all or building store. You will need staples as well, obviously; a good size is 9/16 of an inch. You will need a carpet knee kicker, which can also be rented. If you are installing new tackless (see below), the strips can be trimmed using tin snips for a nice even cut. And finally, grab a hammer to fasten the tackless. If you have squeaky stairs, this is your opportunity to take measures to eliminate the squeaks, while the carpet is ripped up. Stair treads are held in place with nails. Over time, those nails can sometimes work free, thereby loosening the tread somewhat from its support. When this occurs, the section of the tread that has loosened flexes under pressure -- when you step on it, it moves down, and when you step off of it, it moves back up. As it moves, it emits the creaking sound. The method of eliminating squeaks from stairs is not incredibly scientific but it is effective. It involves a power drill and some one and a half inch floor screws. You can find floor screws at a flooring or home renovation store. Drill a few screws along the outer edges of the tread, close to the existing nails. This will secure the tread to the supporting stringer underneath. You should then notice much quieter steps. If you have not had carpet installed on your stairs previously, or had a carpet that had an attached cushion, then you will have to install new tack strips. Install the strips along the back of the tread, where it meets the riser, leaving just enough of a gap to tuck the carpet over (approximately ¼ of an inch should be good). Be sure that the nails are angled towards the riser. For stairs that are closed in by a wall on at least one side (i.e., stairs that do not have railing posts on that side) install a piece of tack strip along the edge of the wall – again leaving a small gap – with the nails angling towards the wall. If you have a staircase that features three pie-shaped stairs which combine to make a 90-degree turn, you will notice that the middle pie is set into the corner of your walls. This means that on this stair, you will have three strips of tackless: one along the base of the riser, and one along each section of wall., you will notice that the middle pie is set into the corner of your walls. This means that on this stair, you will have three strips of tackless: one along the base of the riser, and one along each section of wall. Note: if you are following these instructions to install a carpet runner on your stairs, use only the piece of tackless at the back of the stair; do not install tack strips along the edges of the runner. They could cause serious injury if your foot happens to land on them. If your stairs are open on at least one side with railing posts on them, install a piece of tackless lengthwise between the posts, with the nails angling away from the stair. This will not only hold the stretch of the carpet but will also prevent the carpet from having a noticeable dip as it extends past the underpad. As mentioned above, the entire staircase is not installed in one whole piece of carpet. Cut your carpet down to manageable sizes. If you bought your carpet in a full 12’ or 15’ width, then start with cutting it into strips that are the width of your stairs. Then, you can even cut those down so that you are working with one or two stairs at a time. Be sure to measure each stair before you cut the carpet for it! The stairs may not all be the same size. Leave a little bit extra on the piece to avoid cutting it too short, and trim the excess during installation. Trim the underpad to fit each tread, coming up to the edge of the tack strips (it does not go over them). Bring it up to the edge of the tread; do not wrap it around the lip. Fasten the pad by stapling at intervals. Now, you are ready to install the carpet on your stairs.